Superintendent Barresi took some time out at the Republican National Convention today to distort her own agenda and dispel the myth of the War on Women (sort of like Bill Price’s war against the myth about poverty). She blames the funding problems for Oklahoma schools on Obamacare. That retelling of the story forgets the fact that her first budget only funded 10 months of benefits for teachers, that she continued claiming it had been fully funded, and only after several months did she ask the legislature for more money to fully fund benefits. She also looks to a Republican Platform that she says would increase local control of schools. Ask anybody working in public education in Oklahoma right now if they feel like they have more local control under the Barresi regime. I doubt you’ll find one. Don’t let any of these people off the hook. Call out what’s bogus. As you may have heard, school districts this week received notice that the original allocation notice they received in late July has been modified. Now that the SDE has taken care of virtual and charter schools, less money has been reserved by the state. Districts received revised notices a couple of days ago, and most are still way short of where they were last year. Nine million? By my math, that takes the reserve down to $55 million, or 3.02 percent. It’s still twice the mandate. Maybe, as a member of the legislature, it should bother Rep. Nelson that the SDE is not allocating the money to schools as directed. No, that’s not it. He responded by coming to the Board meeting and complaining that school districts are ending the year with a fund balance. Because of the way state aid payments are made to schools, some fund balance (or carryover) is necessary. Without one, checks written at the beginning of the fiscal year would bounce. Any number of businesses operate under the same principal. It just makes good fiscal sense to reserve enough money to pay your upcoming bills. That’s how I run a household too. And if that bit of teamwork wasn’t enough, Rep. Nelson then got some added support from Board member Bill Price, who is also chairman of the Oklahoma School Choice Coalition. Price stated that poverty affecting school performance is a myth and that districts’ complaints about funding problems are also nonsense. He then suggested allowing businesses to audit school districts to suggest ways they can cut costs. Barresi agreed. So did Nelson. To be fair, I followed this discussion through the tweets of Capitol reporter Erin Boeckman, who always does a fantastic job of keeping political junkies informed. Maybe I missed something in the context. It’s hard to say. What I can say is something I’ve already said. I’ve said it over and over. The legislature has decreased funding for public education repeatedly over the last five years. Meanwhile, public schools are enrolling more students. Exacerbating this is the decision-making by the SDE, which chose continues to withhold more than twice the mandated amount of state aid in its reserves. These studies planned to look at funding for education are a farce. They’re a song and dance performed by politicians intent on bleeding public schools dry. School districts are already cutting costs. They’re cutting services to children. They’re cutting remediation programs. They’re cutting bus routes. They’re cutting staff. We don’t need random businesses to come into our schools and tell us more about that. This week, it seems that every time I turn around, somebody is saying something that makes me want to write. With all apologies to Ann Romney, what’s wrong with “you people”? I have to work, you know. So I’m going to throw a few thoughts out here and hopefully have more time to write a little bit later this week. Oklahoma’s conservative think tank and proud ALEC cheerleader OCPA has been promoting two articles repeatedly on Twitter. The first is critical of Oklahoma City Public Schools staffing decisions and declares that equity is merely a road to mediocrity. Such logic ignores the fact that OKCPS is increasing in enrollment while all school districts in the state continue to see less funding. The second is being continuously retweeted with the message that “The intellectual debate over the broad principles of education reform is over.” This is a great tactic in political rhetoric: plug your ears and make sure your opponents know you’re not listening. The fact is that education reform proponents do not engage their opponents in intellectual discussion. OCPA has been playing the same “Public Schools Are Bad” song on a continuous loop since their inception almost 20 years ago. They have not spent the time in the classroom with students to know what teachers do every day. They have not logged the hours in professional development, meeting with parents, planning, and grading papers. They smugly criticize a profession that gets beat up in the media, and the only reason to pay attention to them is that for some reason, the state’s largest newspaper takes them seriously. What they say has an audience, and that is unfortunate. Meanwhile, both the Oklahoman and the Tulsa World reported on the 2012 release of ACT scores. And Superintendent Barresi had her say as well. 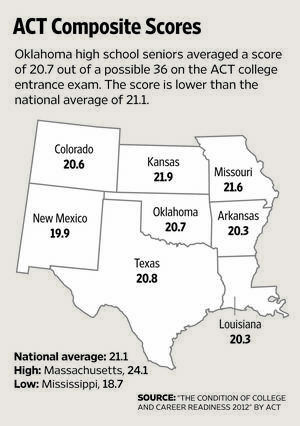 As the graphic below shows, Oklahoma students are in the middle of other states in the region for ACT performance. Composite scores are relatively flat over time. What the numbers don’t show is the fact that Oklahoma has one of the highest percentage of students taking the ACT. That affects performance of the whole. And while Barresi is right to want to see improvement, but her quest for more rigor in science is going to be thwarted by this state’s intent to bury its head in the sand and continue down the path of developing standards in isolation – and by ignoring actual science. At least the Muskogee Phoenix has it right. Something has to be done about the path of destruction that the current occupants of the legislature are cutting through public education. In other news, Barresi is planning a media briefing for tomorrow on the timeline for the release of A-F Report Cards. I posted that over the weekend. You can read the instructions they sent out to school districts here. And you can save yourself the time and just pull from any of a number of prior quotes on how parents understand letters better than numbers, and how we need to learn math better in this state. Or something like that. In Prague, a girl said hell and people got pissy about it. I started keeping track of the number of districts who have passed resolutions saying that we need to stop the insanity of standardized testing, and suddenly, I got a lot of attention from other states too. And my number is way off. Melissa Abdo tells me at least 83 Oklahoma districts have passed some version of this resolution. In response, Barresi has pretty much said so what? It’s only Wednesday, and I’m tired. School has started, and there’s a lot going on. Between now and [SPOILER ALERT] the first week in October, when the A-F Report Cards finally come out, I think we’re all going to be flat-out exhausted. By now you’ve probably heard about the Prague High School senior denied her physical diploma because she used the word hell in her valedictory address. It’s all over the national news. Yes, I’m going to pile on. As much as it annoys me when people who don’t know what the hell they’re talking about make public education look bad, I have no tolerance for when we do it to ourselves. This student has a full ride to college. She has an outstanding academic record, and she is very active in the community. The school wants her to write an apology. She has refused. Good for her! I hope this shows a pattern of behavior of a smart young lady using her words to say what she means rather than to get what she wants. We’ve seen throughout the summer how much frustration comes when people with too much power deny students diplomas. Being a bully typically just shows you’re a coward. This student has graduated with the highest honors her school could bestow upon her. Now they won’t give her the paper signifying the achievement. Something tells me that in parts of the community, language has since escalated beyond the offending word. By the way, you currently can’t get to the district’s home page, but you can click on the red devil mascot below and get to the high school page. I have created a new page at the top of the blog where I will keep an updated list of districts in Oklahoma that have passed resolutions calling for testing reform. I will update it as I get information that I can verify. If you see any omissions or any districts that I have included by mistake, please pass that along. As this movement builds steam, it will be useful to keep a running list of districts that don’t want testing to be the be all end all of education policy. Any frequent visitor to this blog knows that I’m not a fan of A-F Report Cards. It’s not that I don’t want school districts to be accountable; rather I don’t think the new system increases understanding of a school’s performance. They are simplistic more than simplified. They take large quantities of student and school outputs and distill them down to a single letter. Lost is an understanding of how the school gets to that ranking. Perhaps more importantly, this new report card provides more straightforward information than performance ranking systems used in the past that were confusing and cumbersome for the average parent or community member to understand. I don’t know about the rest of you, but I never found the difference between a school with a 1200 API score and a school with a 800 API score that hard to understand. I guess that means I’m above average (said quite proudly). I included the fourteen page guidance from the SDE in the link above so you can see for yourself how the sample report cards will look. They won’t go live until October. Schools will receive embargoed preliminary data later this month and have an appeals period before the final report cards are released. While the intention of releasing these report cards is not to point fingers at anyone, it is an opportunity that will allow parents, citizens and all stakeholders to determine how a school is performing without having to interpret complicated information. The report cards will also be an important piece of information parents can use when deciding the best educational options for their own children. In other words, parents aren’t capable of understanding complicated information. That seems contradictory to the claims by strident School Choice proponent Rep. Jason Nelson, who takes great offense to suggestions that parents don’t know what’s best for their kids. As for the accountability part, the important thing to remember is that there are no tangible rewards (a certificate and photo op don’t count) attached to schools that get an A, and the penalties for low-performing schools aren’t tremendously different than they were under the previous accountability system. These reforms help politicians far more than they help parents. The simplistic labels make for good talking points as they try to increase public support for vouchers and charters. Maybe that’s what Barresi means by average. The diplomatic thing to say would be that there’s enough blame to go around. We always want to do the diplomatic thing and look for ways that we all could make a bad problem not so bad. This is not the time for that. Oklahoma City Public Schools Superintendent Karl Springer had a meeting tonight at Cleveland elementary to discuss the loss of science, art, and music positions. I wasn’t there, and I can’t speak definitively for anyone who was. I caught up on the discussion after the fact from the Foundation for OKCPS Twitter account. Parents spoke. Kids spoke. They were passionate about the education they want. These are people who came to a publicly funded specialty school, enticed to stay in an urban district by the improvements from MAPS spending. Now they feel let down. It sounds like Springer stood there and listened to concerned parents, as he is known to do. It also sounds like he explained in numbers how hard it is to manage programs in the state’s largest district in these times. The key statistic from tonight is that from 2008 to 2012, state aid to OKCPS has dwindled from $107 million to $92 million. As I said, I wasn’t there. But I know who dropped the ball on this one.